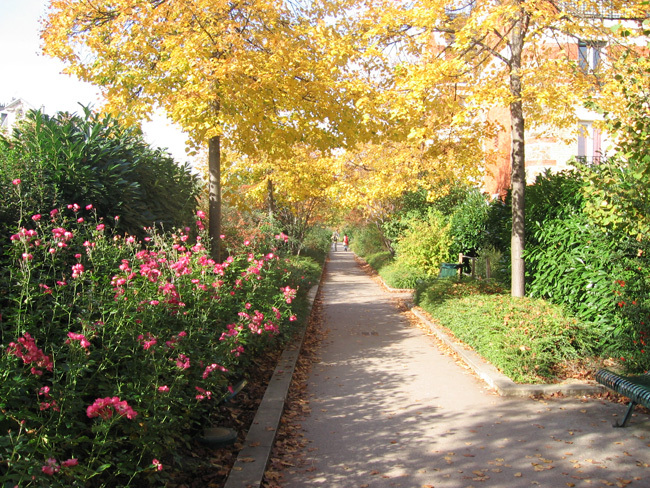 A beautiful autumn stroll at the Promenade Plantée. The Promenade Plantée is a very unusual park: Starting near the Bastille, the park begins as a long, narrow path that's raised up over the streets of Paris! This raised walkway, flanked by greenery, was built in the 1990s on old elevated train tracks that hadn't been used in many decades; part of an old train system for commuters into Paris from the suburbs. The first couple kilometers of the park are raised up on these tracks, and then the park gradually lowers to the ground level, but still continues in its straight and narrow South-Eastward trajectory, all the way out to the Peripherique, the hectic beltway that surrounds all of Paris' Zone One. The whole path is 4.5 kilometers (2.8 miles! ), and the terrain and scenery change drastically from section to section. It starts out with beautifully manicured gardens, but the greenery disappears at times and you're walking between modern apartment buildings, and then the last long stretch is surprisingly green and lush and quiet, and it's hard to believe you're still in Paris. One of the large tunnels  home to hundreds of bats  at the Promenade Plantée. After my first stroll through the Promenade Plantée, I did a little research about its history on several French websites, and that's when I found out about the bats. Once the Promenade lowers down to the ground level, it passes through several long, cavernous tunnels; these are overpasses for the Parisian traffic above. The largest of the tunnels have a really neat, faux-nature decor, with cave-like rock projections and (man-made) trickling fountains. 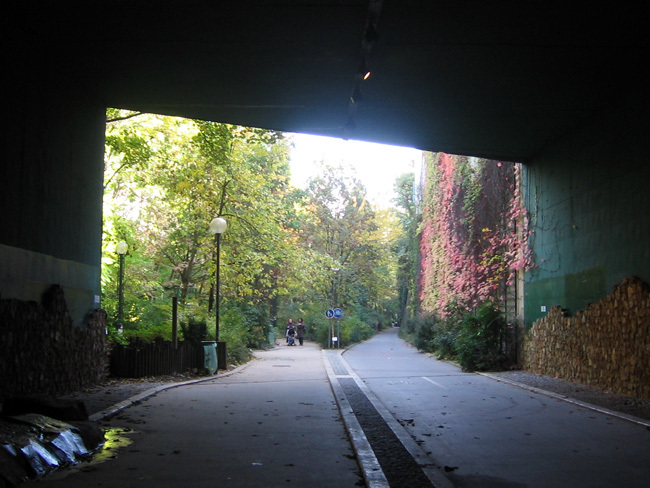 Many French websites that discuss the Promenade Plantée mention that these tunnels have become a haven for bats. The bats  chauve-souris in French, meaning bald mice! why not flying mice?  live in little cracks and fissures in the ceilings of the tunnels, and also hibernate there in winter. A census of the bats in the Promenade Plantée tunnels was taken in 1998 and nearly a thousand bats were counted. If you visit the Promenade Plantée during the warmer months, you'll see the bats everywhere as dusk arrives, particularly darting in and out of the tunnels, and flying around near the ceiling inside the larger tunnels as well. In the colder months it's less likely you'll see them. There are three main bat species found in the tunnels; the Pipistrelle being the most common, with the Common Noctule and Common Serrotine appearing much less frequently (so... why are they called common?). They're all pretty tiny and cute, in any case. The Promenade Plantée is open from 8am (9am on weekends) 'til nightfall. The easiest way to find it is to go to the Place de la Bastille (Métro: Bastille )  that's the big traffic circle with the monument marking where the Bastille prison used to be  and look for the huge opera house; a modern, sort of cylindrical building, covered in shiny windows and with a big staircase out front. Put yourself in front of the opera house, and walk to the right, so you're keeping the opera house directly on your left. This street is the Rue de Lyon. Walk a few hundred yards and eventually you'll see a large red brick structure on the left; you're looking at the end of the old train track platform. There's a concrete staircase there at the corner that takes you up to the Promenade Plantée (and once you've found the staircase you'll see the small sign out front confirming this). Here's a map showing where the entrance is. If you want to walk the whole long distance of the Promenade Plantée (which I recommend!) be aware there are a couple places where it looks like the park is ending or the scenery changes and it looks like it's going to get boring. Keep going! When in doubt, just keep going straight. The last stretch is very nice and green and quiet and you'll eventually know for sure you've reached the end when you arrive a weird spindly green metal tower with a spiral staircase in it. Beyond that is a dead end; there's another old tunnel there that's boarded up. If you want, you can take the spiral staircase up to the top of the little tower and walk a short gangplank over to the sidewalk above, which is right on the edge of the Peripherique (beltway); you'll see and hear tons of cars speeding by. That's it! You've reached the end of the Promenade Plantée. You can then walk the whole way back, or take any of the many side paths that ext onto the streets of the 12th arrondissement and find the Métro from there.